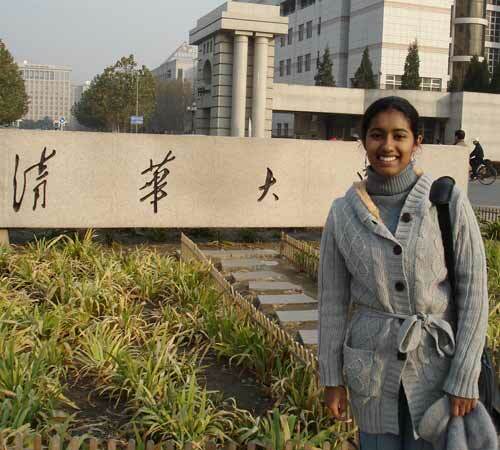 Umme Aiman Ahmad (Moutushi), a Bangladeshi, is currently following an MID program (Master of International Development) in the School of Public Policy & Management of Tsinghua University. The principal reason she decided to further her education in China is that she was born here. She says it feels wonderful to return to China, and she can see how much the country has changed. Like her Chinese name "Wu Mei", (Mei means beauty in Chinese), she is a beautiful young girl. This is the first time Umme has been back to China since she was born here. Her father is a diplomat and at the time had a posting in China, so Umme was born in a hospital in Beijing and lived here for four years with her family. To her China is a very special place. "Because of this, I thought that I should learn to speak Chinese." Umme said, "It would feel strange to me not to be able to speak Chinese. So I have come back. I love China so much." The other reason she would like to learn Chinese lies in the demands of her work. Previously Umme took a Business Management bachelor's degree in Singapore Management University and after that she worked in marketing and sales in Singapore for six months. However she found that in Singapore Chinese is the dominant language, so she decided to come back to learn Chinese, in order to perform better in marketing and sales in Singapore. For the first nine months she studied at Beijing Language and Culture University. During this period she met a lot of Chinese enthusiasts and made a lot of friends from different countries. Subsequently she applied for an MID program in School of Public Policy & Management, Tsinghua University. One advantage is that this program is offered in English; another is that in contrast to programs offered by other universities, the MID program takes only two years. In addition, she is fascinated by international development. It is very interesting to see how China has changed and developed with her own eyes. Before she came back to China, she had already heard many things about the country from her father. However once here, she found that much in China is thoroughly different from her father's description. China has developed a lot and is currently going through huge changes. She recalls that her family used to live in Guanghua Road, Chaoyang District. When she went back there she found that it had completely changed, so much so that she could hardly be sure that it was the same place where she had lived for four years. According to Umme, there are at least 20 nationalities in her class of forty. It is great to spend time with these lovely classmates because she can come into contact with diverse cultures and learn a lot from them. In her opinion, China and Bangladesh share lots of cultural values. Like the Bangladeshi, the Chinese are not too open, nor are they too conservative, and the Chinese have been very kind to her. She has made friends easily with Chinese students and she is comfortable living in China. In general she loves Chinese food. Like many foreigners, she is familiar with spicy Sichuan food. Talking about Chinese food, she jokingly says that before she came to China she liked dumplings very much, but when studying in China she bought them a little too often, and now she doesn't want to eat dumplings anymore. In her spare time, like other young people, Umme likes to listen to music and chat with her friends. She says that most of her friends would like to come to China, either as tourists or for other reasons. She has travelled to many places in China, such as Hunan, Hong Kong, Sichuan, and Inner Mongolia. The first place she went to was Harbin, because she loves the ice sculptures. Umme says she loves to write Chinese characters. Generally speaking, it is difficult for a foreigner to learn Chinese, and even more so to learn to write Chinese characters. To show what she knows, she writes in her notebook the following Chinese characters: her name "Wu Mei (吴美)", and "School of Public Policy & Management (公共管理学院)". There is no doubt that she truly loves China and Chinese culture. In terms of a career plan, Umme says that she doesn't want to be a diplomat like her father, as she doesn't really want to get involved in politics. Through studying in China, she hopes that her future work will be creative and will involve helping people, perhaps working in an NGO or a social work organization doing something worthwhile for her homeland of Bangladesh. Although she lived in China for four years when she was very young, and is enjoying her studies in Tsinghua University, all her family members, such as her grandparents, are in Bangladesh. Sometimes she misses them so much that after finishing MID program her first instinct will be to go back to Bangladesh. However, if she has an opportunity to work in China, she would like to stay here.